The NiteCore SRT3 Defender LED flashlight is designed with law enforcement, self-defense, and outdoor applications in mind. It utilizes the third generation SSR (smart selector ring) technology for smoothly and rapidly selecting brightness levels and function. Infinite brightness adjustment from 0.1 to 550 lumens and six rapidly switchable functions to select from. 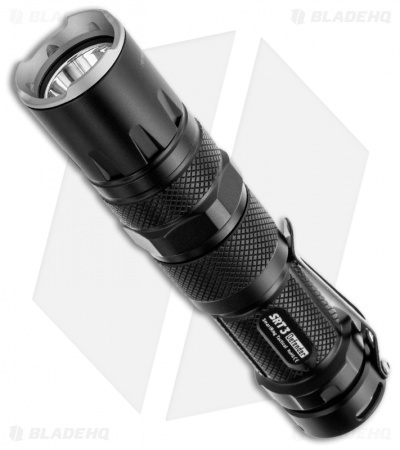 The SRT3 has a CREE XM-L (XM-L2 T6) LED and unique multi-colored (red and blue) tactical/signaling lights. *Measured in accordance to ANSI/NEMA FL1 using one 3.7V 650mAh Nitecore RCR123 battery. Output is less for CR123 and AA batteries.